There are as many as 90 species in this genus of Grass-like plants from the Western Hemisphere, but only Sisyrinchium angustifolium is hardy for us. It's a carefree native, but we've never paid much attention to it because, frankly, it's not very showy. And then along came this selection, which we found at a nursery in Switzerland. It forms a clump of narrow, blue-green leaves 12″ tall and wide that looks for all the world like an ornamental Grass. Then, over a long period that begins in May and runs into July, it blankets itself with starry, lavender-blue flowers that are much larger than those of the species, fully 1″ across. It makes a superb edging, especially along a walk or a terrace. Plants flower best in full sun but also put on a good show in partial shade, and though the species is found in moist locations, they're not the least picky about soil. Thanks to this variety, Blue-eyed Grass finally moves from the wild to a prominent place in the garden. 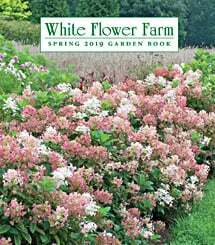 A White Flower Farm introduction. For more information on the growing and care of Sisyrinchium, click Growing Guide. Carefree in full sun or partial shade and average to damp soil. The spent blooms and seed heads that follow are unobtrusive, so no deadheading is required.